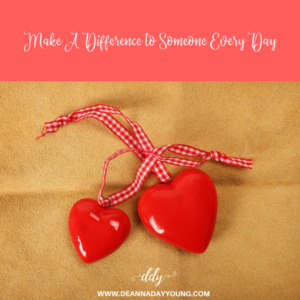 Even though we didn’t log 2,018 acts of kindness during February Make a Difference Month I hope everyone was encouraged to look for ways to make a difference to someone each day and maybe find a way to make it a part of your daily life. As promised we have a winner from those who shared the post and a winner from those who let me know about acts of kindness. I numbered the names for each and had my daughter (who is in Florida) pick the numbers. Our first $50 Amazon Card winner for sharing a post is Sherry Wooton! Our second $50 Amazon Card winner for an act of kindness is Angie Peace Kimbrell for giving a shoutout to her hairdresser! Thank you to all who participated. Let’s go change the world by making a difference to someone every day one act of kindness at a time. This entry was posted in Uncategorized on March 5, 2018 by Deanna Young. Yay to the winners!!! Have fun shopping! Continue to make a difference everyday! SO PROUD OF YOU. MAY GOD CONTINUE TO BLESS YOU IN ALL THAT YOU DO AND SAY. I LOVE YOU.